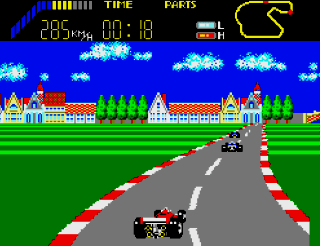 World Grand Prix is a first-party Sega title specifically developed for the Master System, and was part of the console’s North American launch lineup. Although not an official sequel, it is effectively a follow-up to Sega’s 1985 SG-1000 game “GP World”. At first, World Grand Prix seems like nothing more than a Pole Position clone, but spending some time with the game reveals that it has a lot more going for it. Like Pole Position, WGP is a basic, totally flat Formula One-style racing game. Although there are other cars on the track, you’re racing against the clock and your place at the end of the race is determined by where you stand on a pre-determined list of race times. A minimum time must be achieved in order to move on to the next track. Like Pole Position, there are an endless number of other cars weaving around on the track which must be avoided, as well as billboards along the side of the road which can be crashed into if you take a turn too short or too wide. Seriously, who puts billboards on the side of a race track? Unlike Pole Position, World Grand Prix includes 12 unique tracks, each of which is modeled after real Formula One tracks. The first track is the Japanese Fuji Speedway, which is also the track featured in, you guesses it, Pole Position. The 11 other tracks are from various places around the globe, and each even has scenery to match their locale. Your car uses a 2-speed manual transmission which you shift by pressing up and down on the D-pad. As with all old racing games, the touchy digital controls make it difficult to turn your car in small amounts, but this is just part of the challenge. The coolest aspect of this game has to be the track editor. True, you can’t make much of a track with just curves and straight-aways, but just the fact that you can make your own tracks at all is pretty cool. It’s a shame that you can’t save them, but this is to be expected in a game from early in the 8-bit generation. Back then I would have just drawn the track out on graph paper if I wanted to drive it again later (or more likely, I would be sitting in math class drawing the tracks out for use after school!). It’s a shame that we don’t see this feature in newer racing games, Trackmania for the Windows platform being a notable exception. You aren’t going to find much depth in any racing game from the 8-bit generation, but for a game of its age World Grand Prix is a great arcade racing title. Buy World Grand Prix on Amazon. Tagged Formula 1, Formula One, Master System, Racing, Review, sega, World Grand Prix. Bookmark the permalink.